The Stadium Clinic provides care not only for musculoskeletal injuries but also conditions that may be the result of injury, normal ageing or acute, chronic and overuse injuries. The practice is located in Sydney and services the local and greater community. Their patients are typically men and women, ranging in children to old age 70, and focusing on degenerative disease, trauma, sporting injuries and general musculoskeletal conditions. 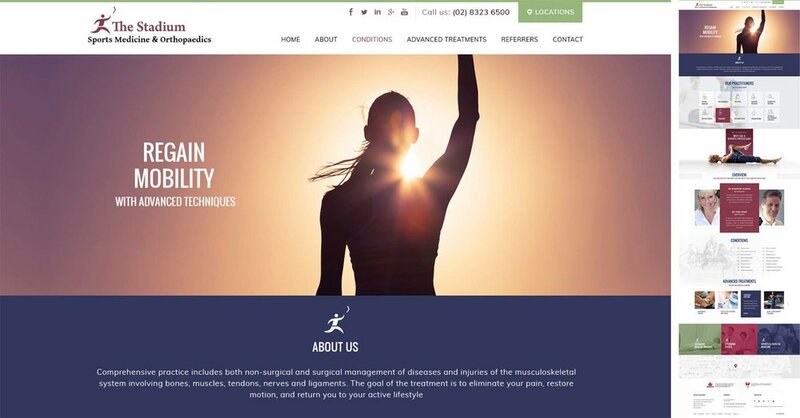 The medical website redesign need to be professional, contemporary, and effective. The website needs to support the patient's’ sense that practice is the right choice professionally as well as showing a caring, safe and local service solution.